There are a lot of studies out there that seem to suggest that a large part of your adult personality is set by age six as the nature of brain growth changes afterwards. Looking at how the millennial generation has been defined, it seems like that theory could be credible. Using data from a 1960s study of approximately 2,400 ethnically diverse schoolchildren (grades 1 – 6) in Hawaii, researchers compared teacher personality ratings of the students with videotaped interviews of 144 of those individuals 40 years later. They examined four personality attributes — talkativeness (called verbal fluency), adaptability (cope well with new situations), impulsiveness and self-minimizing behavior (essentially being humble to the point of minimizing one's importance). Talkative youngsters tended to show interest in intellectual matters, speak fluently, try to control situations, and exhibit a high degree of intelligence as adults. Children who rated low in verbal fluency were observed as adults to seek advice, give up when faced with obstacles, and exhibit an awkward interpersonal style. Children rated as highly adaptable tended, as middle-age adults, to behave cheerfully, speak fluently and show interest in intellectual matters. Those who rated low in adaptability as children were observed as adults to say negative things about themselves, seek advice and exhibit an awkward interpersonal style. Students rated as impulsive were inclined to speak loudly, display a wide range of interests and be talkative as adults. Less impulsive kids tended to be fearful or timid, kept others at a distance and expressed insecurity as adults. Children characterized as self-minimizing were likely to express guilt, seek reassurance, say negative things about themselves and express insecurity as adults. Those who were ranked low on a self-minimizing scale tended to speak loudly, show interest in intellectual matters and exhibit condescending behavior as adults. If this research is credible, it makes me think that laying down a solid foundation early is important and the more thoughtful I can be about following an intentional plan, the better chance my child has of building the types of values that I think are key. The things I know I want to avoid are entitlement, laziness and ingratitude. My plan to tackling any problem is to reverse engineer the solution. What kind of personality traits fight these vices? Probably knowing the joy of an earned reward, seeing positive results after becoming disciplined at something productive, feeling accomplished after hitting a goal that you've worked for. If you agree, here are some ways to use our system to have your children experience these things first hand. Teaching this value can take a long term plan as overcoming the desire to spend everything you have takes a certain level of maturity from your toddler. My son didn't get it until recently and he's almost six. The best I can tell other parents regarding any type of messaging to break through is to be consistent and patient. You want to start off simply allowing them to earn savings dollars. Next is important, in order for them to understand the value of money, you have to let them spend it. If they ask you for something at a store, rather than giving it to them, have them save their money for it. Explain to them that if they avoid spending their money, they will be able to afford a wider choice of items. Teach them the joy of spending their money within balance and how to give and share it. Discipline begins with the ability to withhold your strongest basic desires in order to achieve longer term goals. In the case of junk food and electronic devices, budgeting is important to most of us. These are probably the things your child will have the hardest time parting with so having them master this in my mind should make a lot of other things easier down the road. Patience and discipline are needed to build integrity and grit. Those are the ultimate goals for me as a parent to teach. I think empathy needs to be taught, talked about and experienced to change a mindset of me to we. Highlight moments of generosity and thoughtfulness with gift dollars and praise. Explain to your child how they have the power to make someone feel good, loved and appreciated. I don't know about you but I want my children to grow into helpers, those who are looking outwards and who try to make things better. I hope this article gives you some ideas in your day to day adventures with your little ones. As always, happy parenting! Lisa Chin Mollica has dedicated her life to creating user experiences for adults and children on the web, mobile and in product. She lives in Brooklyn NY with her husband who is a Lieutenant in the FDNY, her two toddlers ages 4 and 6 and their dog Nestle who never stops shedding. Legal: The opinions expressed here are anecdotal and solely my own. All data and information provided on this site is for informational purposes only. 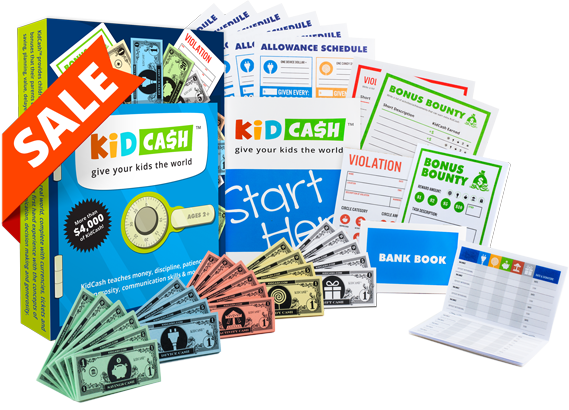 KidCash.com makes no representations as to accuracy, completeness, currentness, suitability, or validity of any information on this site and will not be liable for any errors, omissions, or delays in this information or any losses, injuries, or damages arising from its display or use. All information is provided on an as-is basis. As a parent, I want my child to value school and be self-motivated when it comes to trying his best. I try to connect school with the opportunity to earn the things that he wants but what happens in the summer when he no longer has this source of income? How can we use it as an opportunity to strengthen the message that school is important to his life and is something he should care about? In general, giving him the opportunity to work for the things that he wants lets him experiences earned rewards, something that he sees adults do as well. During the school year, he earns an allowance for each day he attends school, and bonus bounties for the work that we go over on Saturdays. He knows that assignments that are done well will earn him more bonuses than sloppy ones. Things got especially interesting when he suddenly got into collecting wrestlers and was hell bent on buying every single one. Let’s just say every homework was coming back pretty neat. Summer is a great opportunity to make school seem like something he is now missing out on. When we start out allowance, I point to the empty piles and say, “Man, see how much money you’re missing out on now that you don’t have school or sports?” I can see the look of stress on his face when I say this. Then I usually follow with, “Well that’s okay. We’ll look for plenty of bonuses whether it be you cleaning the house, or helping dad. We’ll figure it out. And…OH, I forgot to tell you. Your teacher gave us all of your notebooks from the school year. We never checked those! So when you need some extra cash, we can review how you did last year and get you some bonuses. How does that sound?” He got really excited. The point of doing this is to create an understanding that even work that wasn’t reviewed can be used towards the things that he wants. When he starts school next year, hopefully he will consider this when he is sitting in class. Knowing that we really pay attention and look at everything also lets him know that we care, which makes it much easier for him to care. I hope that this gives you some ideas of your own. As always, happy parenting! In the beginning of the school year, we were receiving concerned notes about Ryan not paying attention and seeing below average scores. We worked hard and saw amazing results. What we have been doing: We focus our comments on speed, accuracy and neatness. How we have been doing it: Dad does an awesome job of making sure that homework is the first thing that happens after school. Then at allowance time (every Saturday morning), we go through all homework assignments. Any examples of neat accurate assignments increase the frequency of bonus dollar rewards. We use a rubber stamper to create this physical moment of pride while he gets to stamp his assignment and hear what I liked about it. He loves explaining to me what it was about and how he solved the problems. He loves it when I notice his efforts and I've seen it really motivate him to try harder. Most reward systems or piggy banks rely on real money to incentivize actions. Since money has a set monetary value within the ecosystem in which you exchange it for goods, you don't have any control over what it's worth. Even at a quarter, it can add up quickly. This means that somewhere down the line, you are limited as to what you can award and how frequent that might be. Now that school has started, getting the children to wake themselves up is on my list of top priorities because the sooner they can master this, the more relaxing my mornings will be...and let's face it, we need all the help we can get in September. Now that we have an established currency where they know that certain currencies can be exchanged for tangible rewards, I can use bonus bounty as an incentive. How Does Charging My Child a Device Dollar Help Them Later in Life? I think it's important to take a long view of the things that we do every day and how they can help or exacerbate a problem down the road. When it comes to digital devices, my goal isn't to teach them to avoid using them but rather to enjoy them with balance. I want the act of putting the device down and out of reach something they are comfortable doing. The way that I can help this is by giving them more things to consider when in that immediate mindset. I want them to think about the situation that they are in and appreciate that there are times when experiencing something else is also valuable, such as face to face time with someone you care about, or physical activity. As long as these points are met I would be satisfied and feel successful. Human beings and especially children are strongly stimulated emotionally by visuals. This is why the media has such a powerful impact on the way that we think and the things that we do. Your children are constantly surrounded by ads, movies, television and video games. Most of this is geared towards simple pleasures and consumerism. When your children are at one of their most active cognitive development stages, the period before age six, it's even more imperative that we take a proactive stance to balance out this with positive influences. Praise, in my opinion, is the most powerful motivator that you have in your arsenal. I place positive language way above the incentives of earning KidCash or anything else. Calling attention to all of the wonderful things they do will not only make them feel good about shifting their behavior but encourage them knowing that their parents love and believe in them. KidCash was built as an easy way for you to systematically highlight the small accomplishments they make daily. Combine verbal praise with the ability to earn rewards. The rewards themselves translate to the child's ability to control what they can do and have in their lives and so it serves as another form of lending trust to the child and encouraging independence. Whenever I notice something positive that the children have done, I write it down. I will repeat it at the end of the day as well as when we give out allowance. I will mention these things randomly as well. How do I know it's important to my child? I hear him repeating these messages back to me with why he's making a productive decision. Not only is it motivating him, but it's building up our relationship as he sees me as a person who watches and cares. We encourage positivity as a way to use our product for many reasons other than making your job easy. We hope to give you the best shot of getting their attention, getting through to them and building a close relationship built on communication, trust and love. We hope this helps gives you more ideas in your daily journeys taking care of these little ones. As always, happy parenting! When it comes to eating, I want my child will be able to mitigate his own healthy balance. Sure, junk food is bad but treats are surely fine if one understands not to overdo it, to balance excess with exercise and to make sure that you eat the nutritious food as well. I want my children to understand the connections that can help mitigate a healthy lifestyle. Knowing that this was my goal, I devised a long term plan using cereal and candy dollars that started two years ago. Today, we reached a huge success milestone! My children used to pick out the cocoa puffs or the sugar frosted mini-wheats. So would I, they're delicious. As children, they have no other motivation to do any differently than the pleasure that sugar gives to their brain. My plan was to educate them over time, and slowly wait for them to make the decisions on their own. I wanted their motivation to be awareness and caring about their own health. I wanted them to trust my advice because they trusted me and knew that I loved them and wanted what is best for them. The Cereal Plan At first I would make the choice between cocoa puffs and cheerios drizzled in chocolate. I would explain that the cheerios have more nutrition in them and less sugar than the cocoa puffs, even with the chocolate syrup. Any time my child would choose the cheerios, at the review he would earn a bonus candy dollar. Whenever he would spend the candy dollars, I would repeat the message that candy should be budgeted, but it's fine to have dessert or a treat after a nutritious meal. Once he started to regularly choose the cheerios, I switched up the cereal to a highly nutritious granola and raisin brand cereal and made that the one that would earn him the bonus dollars. I referred to it as the "good" cereal or "better choice". He's been choosing this cereal for a month now and choosing to keep the raisins in. This morning, he told me he didn't want the chocolate syrup. As long as I've been patiently pushing this program, that's the words that I wanted to hear. I wanted him to want to make the decision for himself, not because I had asked him to. I haven't even been rewarding bonus dollars anymore for the better cereal. He's been telling me that he wants to eat better, he wants to feel good. I think that the main point of KidCash is to get their attention and motivate them to practice your lessons. Once you have their attention, you can repeat your positive messages until they understand and want to make decisions that better themselves. We hope this helps you in your endeavors. Happy Parenting! My goal for KidCash isn't for my children to obey my every command, but to think rationally, make their own decisions and learn how to communicate. I want to be seen as more as a guide showing them the way the world works. My child will go through phases. Some are really pleasant where we don't hit any bumps in the road for weeks...and other times are a bit more stressful where he is trying to find ways to be defiant to see if he can upset me. That's fine baby tiger. He needs to practice these skills for when he becomes an adult and needs to question authority, negotiate a raise or communicate his point effectively to another person. As a user experience designer, my job isn't to stress that people should be a certain way. It's to watch, observe and try to figure out what the solvable problems are that I can help with. My job is to be patient when someone does something unexpected and negative because I might not understand the causes at the moment. Children are exploring their world and their boundaries constantly. It is part of the growth process. I can only help my children identify moments of stress and unproductive behavior, suggest better ideas and let education take over. I've found that by simply repeating messages, allowing moments where my children can witness the truth in these statements first-hand have led to more stable long lasting behavior improvements. I only want my child to change because he/she understands the why and not just blindly obey orders. I respect this quality in adults and want my child to be able to think critically for themselves and others. I hope this gives you a little more patience the next time your young one is trying to test your limits. As always, happy parenting! Get started with KidCash today because parenting shouldn’t be so hard. A Must Have for Any Parent!!! Stop the Arguments Now!!! Marisa S. says...Kidcash is a terrific product. My kids love it. It really motivates my children to behave. They actually get excited about putting away their toys and making their beds. Jasmine B. says...Wonderful product!!! Discipline without me raising my voice or my blood pressure. Easy to learn how to use for both the parent and child!! Glad someone finally came up with this! !